Skandaalkamp is situated on the Frankdale Waste disposal site just off the N7 outside Cape Town. It is one of 4 camps on the dumpsite and is primarily what I would refer to as a “bush” settlement as a result of the poor service delivery the people of the area receive. They have no formal roads, no clinic access, no electricity, one tap for every 6 families and 1 outside “bucket” (non-flushing) toilet for every 6 families. Thozama Qosongwana is one of the first residents and remembers living there as far back as 1985, making the settlement (according to her) older than the nearby Dunoon where residents have received brick houses, electricity, two primary schools, a high school, a dedicated clinic and various other services from the Government. Thozama’s mother moved to Skandaalkamp after struggling to obtain employment to feed her family. She chose this site as it was located on a landfill site which was mostly unregulated which meant that they were free to scavenge from the site where she said many companies dumped “good” and bountiful food supplies after reaching its sell by date. She insists the food that was dumped by companies in those days were of amazing quantity and quality if you obtained it soon after being dumped. Nearby factories also dumped fabric which she used to sew clothing that she sold. She also chose the site due to its proximity to Rooidakkies (another small settlement nearby on the same landfill site) which in those days served as a hostel for men who were brought in to work in the surrounding area. She bought beer which she sold to the hostel workers at a small profit as a source of income. Skandaalkamp grew from there and has remained largely untouched. It houses around 270 families ranging from single individuals who have nowhere else to go, to elderly people who have not got the means to obtain a better home. Many single mothers and families also call this home and there are around 180 children residing here between the ages of babies to 18 year olds. Many residents are HIV positive and do not have the recommended nutrition to support them in their condition. Children are malnourished and underweight and some children have special needs for which they receive no support or special education. 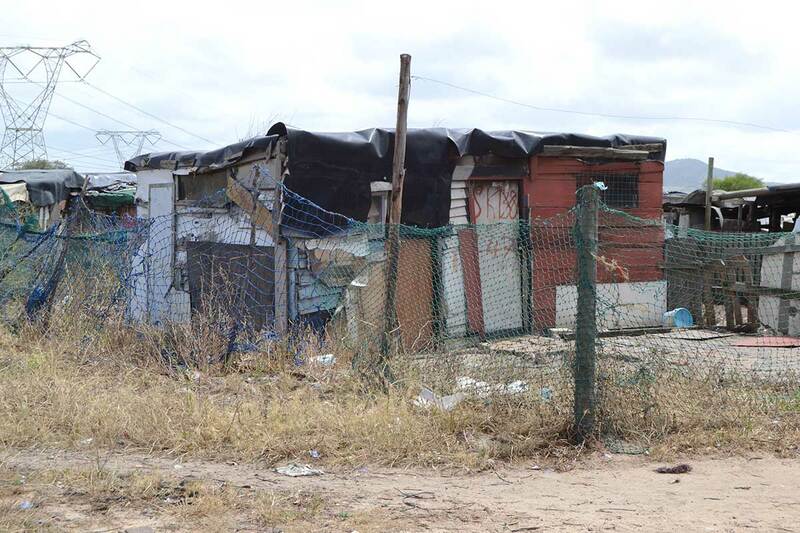 Residents build their shacks from scavenged materials found on the dump and they are mainly makeshift structures with very poor stability and limited ventilation. Most of the structures leak terribly in the rain and have very high mould content due to damage and getting wet over time. With stricter regulations in place, scavenging has become very difficult and a limited resource of food. Many residents make use of the bountiful Port Jackson trees in the surrounding area for building material as well as firewood for cooking and heating of water. Where possible, men chop wood to sell on the side of the road. With no money for transport and very limited transport in any event, residents struggle to obtain gainful employment outside of their village. Children are transported to schools by bus (mostly only primary school students as high school access is a little more difficult) but there is only one bus which arrives on the nearby road at 6am. Children who miss the bus cannot attend school as there is no other way to reach it. Parents are not all responsible and many are simply too lazy to wake and prepare their children to be on time for the 6am transport. School starts at 8 and finishes at 3pm when children are returned home by bus. Shacks are tiny structures (mainly two roomed structures consisting of sleeping quarters and living quarters) and entire families usually share a single makeshift bed of foam on crates. Some luckier families have a double bed but the quality of the furniture is usually not very high. Living quarters are usually stained black with soot from the cooking fires which are made inside in the winter. Most residents (including children) struggle terribly with chest infections and other avoidable ailments as a direct result of their living conditions. Many children (including babies) obtain burn wounds and infections as a result of the fire pits they use inside the tiny structures but they simply have no alternative. When the Cape Town rain season starts, it can rain non-stop for days during which outside fire pits cannot burn and food must be prepared. It is also a source of heat for the families living in structures made of scrap materials often with no windows (just empty gaps for air) and sometimes no door to keep the cold at bay. The settlement is riddled with broken glass and rubbish as there is no formal garbage removal and children run barefoot as a result of poverty. Most children simply do not have shoes, those that do often have broken shoes but they at least protect little feet from glass, thorns and other dangerous items. Some of the items we have removed from children playing include used condoms, syringes, glass, cracked and withered batteries and much more. Many of those who attend school do not have school shoes and carry their school supplies in plastic shopping bags as they have no money for backpacks. If they do not have school supplies, they are unable to do much work. High school attendance rates are approximately 5% (Five percent) and high school completion is unheard of. Most adults living in Skandaalkamp have no more than a Grade 3 education. Unemployment is around 70 to 80% with those who are employed working mainly temporary or contract positions. All workers are employed in the unskilled market as they are under-schooled and have no access to skills development or training of any kind. Vegetable gardening is a primary source of food but gardens are made in the soil which is filling with toxins from the waste disposal and hazardous waste disposal sites which surrounds the settlement on 3 sides. There are few trees in the settlement large enough to provide any kind of relief from the blazing African sun. Children cannot afford sunscreen or hats. Shacks are hot inside and covered in flies drawn by the nearby landfill site. Sleeping babies are covered in flies crawling over their little faces. Every day to day activity is labour intensive from picking and preparing vegetables to chopping wood, making fire and finally preparing food then walking to fetch water to wash dishes in a bucket (if you are lucky enough to have one). Washing is done by hand and hung on makeshift lines where they drip into dusty, sandy terrain. In summer, snakes such as the venomous Cape Cobra seek refuge from the heat by entering homes. Those who do not wish to use the bucket toilets and prefer to relieve themselves in the bush have to be constantly aware of the presence of snakes. Children playing in the tall grass and weeds surrounding homes fall prey to snakebites if they are too small to be aware. With no access to primary healthcare, this can result in serious fatalities as their only access to hospital care is by ambulance which is dispatched from Atlantis, nearly 20 minutes by car, if an over-burdened ambulance is even immediately available. This is the area in which I work… In which I try and relieve some of the hardships suffered by people who have (for the largest part) lost all hope. People, who know hunger, know suffering; know poverty in a time when there should no longer be oppression and suffering. I have a Paypal account for funding – 100% of funds go directly towards the project, the preschool I started there and the people for various needs such as assisting them to obtain their identification documents, assisting them in applying for grants (the fees for the documents, photos and their transport), purchasing much needed medication, feeding the children in the preschool 2 cooked meals per day, etc. Receipts can be produced for every amount spent! Error: Error validating access token: Session has expired on Thursday, 04-Apr-19 10:42:30 PDT. The current time is Tuesday, 23-Apr-19 15:12:38 PDT.